I recently attended a conference at a small college in the middle of New Hampshire (Colby Sawyer College in New London). Looking to squeeze a little beer tourism into the trip I was faced with a difficult choice. On the one hand, I could head west into the wilds of Vermont and seek out the highly coveted but hard to find beers by The Alchemist, Lawson’s Finest Liquids, and Hill Farmstead. On the other hand, I could head east to Maine and visit the less hyped, but still excellent breweries in the Portland area—Allagash and Maine Beer Company. I was leaning toward the Vermont excursion, but neither The Alchemist nor Lawson’s are open to visitors, and while you can visit Hill Farmstead, it is literally on a dirt road in the middle of nowhere. To make matters worse, from what I’ve read once you get to Hill Farmstead you wait in line to fill growlers, which don’t exactly transport well on a plane. So when the conference ended on Friday morning and I had some free time before my evening flight out of Boston, the only viable option was to head over to Portland and get a taste of what Maine has to offer. It was not too hard to recruit three friends (Brent, Brian and Jamie) who were also attending the conference and had evening flights to join me for the adventure. Due to time constraints we weren’t able to make it up to Maine Beer Company, but our visit to Allagash was well worth the trip. That’s not to say I was totally able to resist the pull of Vermont. I did make an excursion to the Three Penny Taproom in Montpelier, Vermont one afternoon when there was a break in the conference, but that is the subject of the next post. When Allagash Brewing was founded by Rob Tod in 1995 there were few if any American breweries that focused solely on brewing Belgian styles of beer. Initially they brewed only one beer—Allagash White, an excellent Belgian witbier that must have seemed unusual to American palates in 1995 but has since become highly acclaimed. It has taken home gold medals at both the World Beer Cup (1998 & 2010) and the Great American Beer Festival (2002 & 2005), and holds the #2 position on BeerAdvocate’s list of the top witbiers in the world. 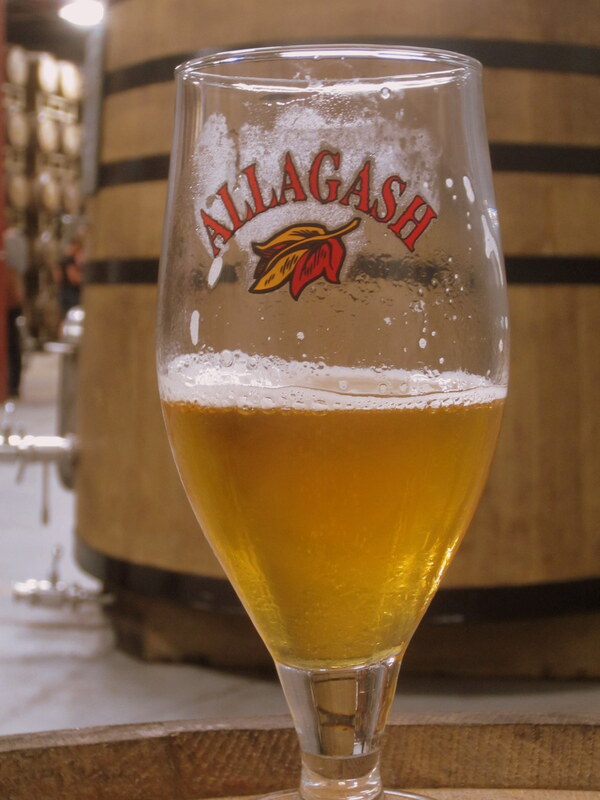 In 2004 Allagash released their first barrel aged beer—Curieux, which is made by aging their Trippel for eight weeks in Jim Beam bourbon barrels. I think it would be fair to say that in the pantheon of American Craft Beers both Allagash White and Curieux are considered classics. 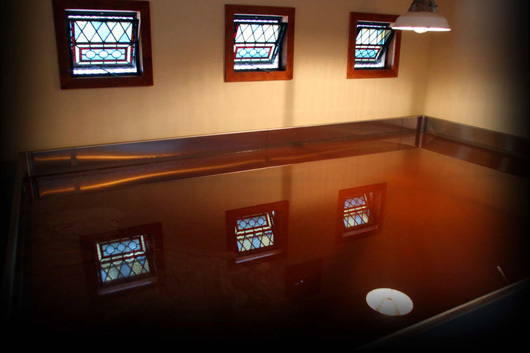 Emulating the tradition of the Lambic brewers of Belgium, in 2008 Allagash became the first US brewery to install a coolship built specifically for spontaneous fermenting beer. A coolship is a large shallow pan that allows the wort to be cooled by the outside air while simultaneously exposing it to wild yeast that wafts in through open windows or slats. When things work correctly the yeast and bacteria that come in on the air do their magic to make delicious sour beer. This is typically followed by aging in oak barrels that host additional wild yeast and critters that do their work on the wort. Although I have visited many breweries since starting this blog, I’ve not gone on that many brewery tours. I normally hit the taproom to sample some beers, and if I’m lucky I might get to chat with one of the brewers. As I learned during this visit Allagash doesn’t sell beer for consumption at the brewery, so you can’t just walk up and order beers at your discretion, nor do they fill growlers. Fortunately, they do offer tours that start on the hour every day of the week but Sunday, and every tour includes samples of four Allagash beers. The tours are free but space is limited so it’s best to sign up in advance. The first tour begins at 11 am and the last one at 6 pm. If you don’t have time or are not inclined to take the tour you can still get a flight of four beers in the tasting room/retail shop at the front of the brewery. The tasting flights are also free, but understandably you can only have one flight. There is also a wide range of bottled beer and merchandise available for sale to take away. We had signed up for the 11 am tour, and after the 2 hour drive from New Hampshire we arrived right at 11 am. I was worried we might miss the start of the tour, but our timing was just right and we walked in just as the guide started checking the IDs of the people who had signed up for the tour. There were 20+ people on our tour hailing from places as far away as Florida and Germany. I’d estimate that more than half of our group were wearing beer t-shirts of one kind or another. We later found out that the Sierra Nevada Beer Camp Across America Festival was scheduled for that evening in Portland, which might have been partially responsible for the fact that such a sizeable group of people signed up to drink free beer before noon on a Friday. On second thought I guess you don’t need a festival to understand the attraction of free beer on a Friday. The first part of the tour was all stainless steel—lauter tuns, boil kettles, whirlpools and fermentation tanks. The guide moved us through this part pretty quickly. It was impressive to see the amount of CO2 bubbling out of each active fermentation tanks, bubbles the size of baseballs coming at the rate of 1-2 per second out of a long black hose that snaked off the top of each fermentation tank and ended in a five gallon bucket full of water. Sprinkled amongst the description of the brewing process I learned a couple of interesting tidbits about Allagash. Firstly, the flagship beer, Allagash White, accounts for roughly 80% of their sales, and secondly, even though they distribute mostly to east coast states, a full 20% of their beer is sold in California. 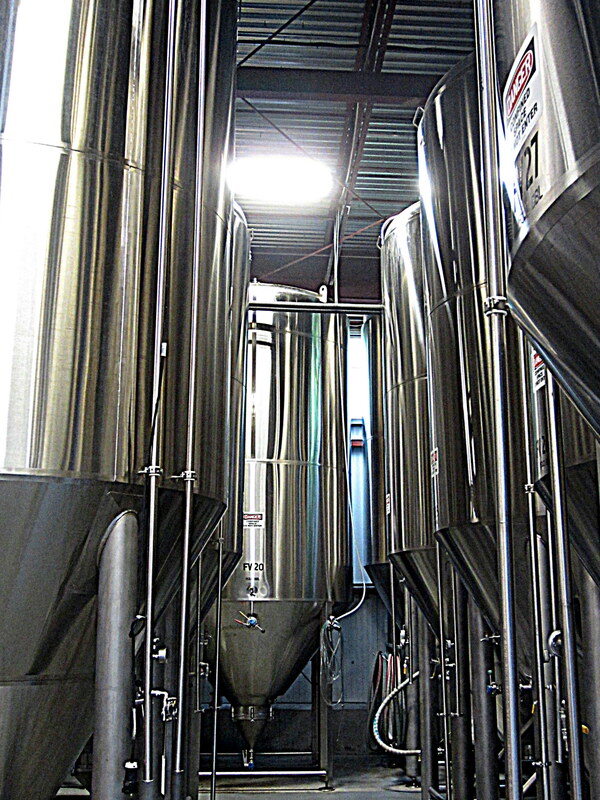 Stainless steel fermentation tanks at Allagash. After about 15 minutes or so we moved into the room where the beers made with wild yeast are aged in wooden barrels. The room was temperature controlled and was pleasantly cool. There were a large number of oak barrels stacked from floor to ceiling. Each barrel had the contents and date of filling written on the bottom of the barrel. Many had names of limited release Allagash beers, like Tiarna, Fluxus, and Red, while others had more cryptic names, unless Allagash is planning to release a beer called “The Password is Taco”. If I remember correctly all of the barrels in this room were wine barrels in a former life. We also learned that they use sulfur to clean out the barrels before reusing them. This led to some discussion about how they got rid of the sulfur before aging the next batch of beer, but despite the fact that I was in the company of three inorganic chemistry professors we never settled on an answer that all of us could agree upon. If interested in the answer I guess you will have to google it, just like I did when I got home. There were also three very large oak vessels called foudres that are used for the slow process of fermenting with Brettanomyces yeast and/or bacteria like Lactobacillus and Pediococcus. A few of the barrels used for aging beer. The “oak barrel room” is where the tasting part of the tour takes place. Everyone was given an Allagash chalice (not to take home though) and for the next 20 minutes or so we sequentially sampled four Allagash beers. On the day we toured the beers on offer were White, Myron’s Walk (a collaboration with Sierra Nevada), Dubbel, and Fluxus, all of which are described in more detail in the next section. You get roughly 3-4 ounces of each beer. Unfortunately, the tour did not include a stop at the coolship, but in talking to the guide I learned that they are only able to use the coolship in late fall because that is the only time the yeast in the Portland air are appropriate for making good sour beer. He said they had also tried using the coolship in the early spring, like they do in Brussels, but the results were not up to their standards. 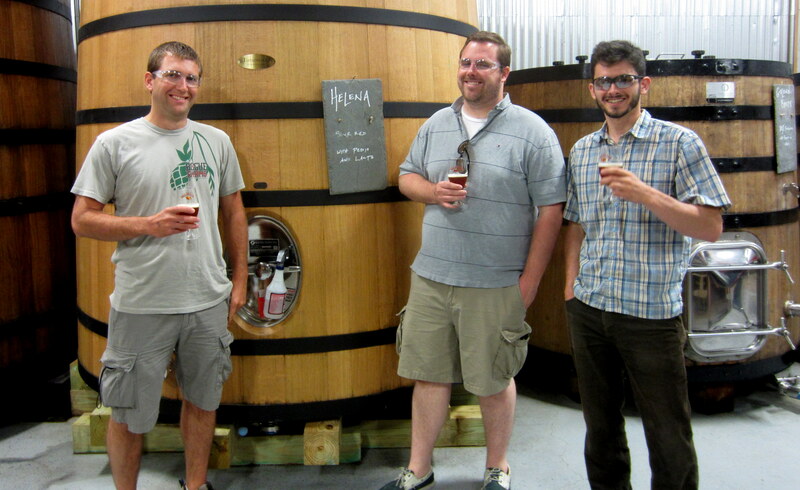 My partners for the day, Brian, Brent and Jamie, in front of a foudre containing a beer called Helena. The final stop on the tour is a room held at an even colder temperature where Curieux is aged in bourbon barrels. 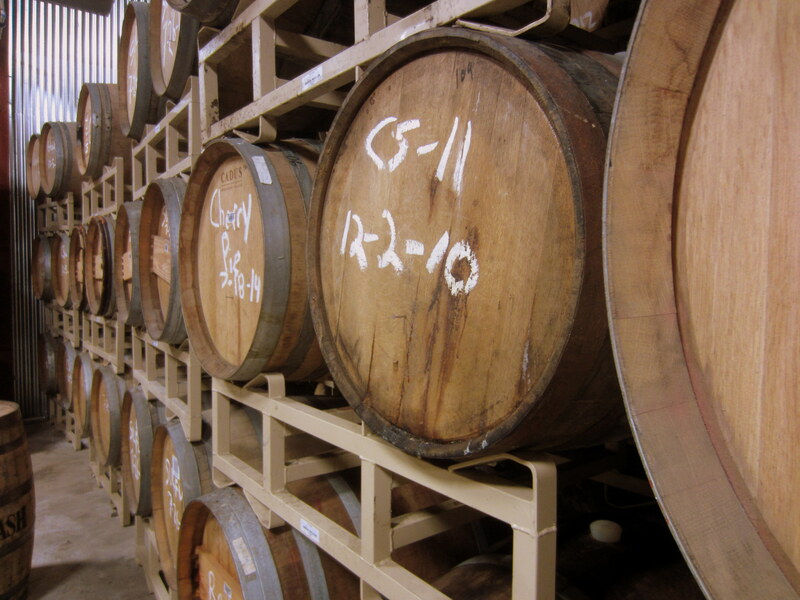 There were also a few batches of beer that involved aging in tequila or rum barrels. Those beers don’t show up on Allagash’s website and at this point are still experimental. As noted above in the tasting room we were able to sample four Allagash beers. Here are my brief tasting notes on each beer. White – The Allagash strain of Belgian yeast is the main attraction here, producing hefeweizen-like notes of banana and other fruity esters that are complimented nicely by the coriander and orange peel spices that are traditional to the witbier style. The use of wheat malts leads to a hazy appearance, a creamy smooth mouthfeel, and a slightly sweet flavor, while the yeast and spices add complexity and a touch of bitterness. I would tend to agree with the many pundits and critics who consider this one of the best witbiers in the world. Myron’s Walk – This beer is a collaboration between Sierra Nevada and Allagash, brewed for the Beer Camp Across America event. It’s a marriage of the American hops that Sierra Nevada uses to such great effect (Citra and Mosaic in this case) and the complex, spicy yeast flavors that Allagash beers are known for. Bright citrus fruits have the upper hand in the nose, but are dialed back a bit in the taste so that the two elements work in harmony rather than competing. This one went down easy. Dubbel – This is the second oldest beer in the Allagash family, and the only dark beer in the tasting lineup. As expected for a dubbel rich dark fruits are the main attraction. It’s a very solid take on the Trappist dubbel style. 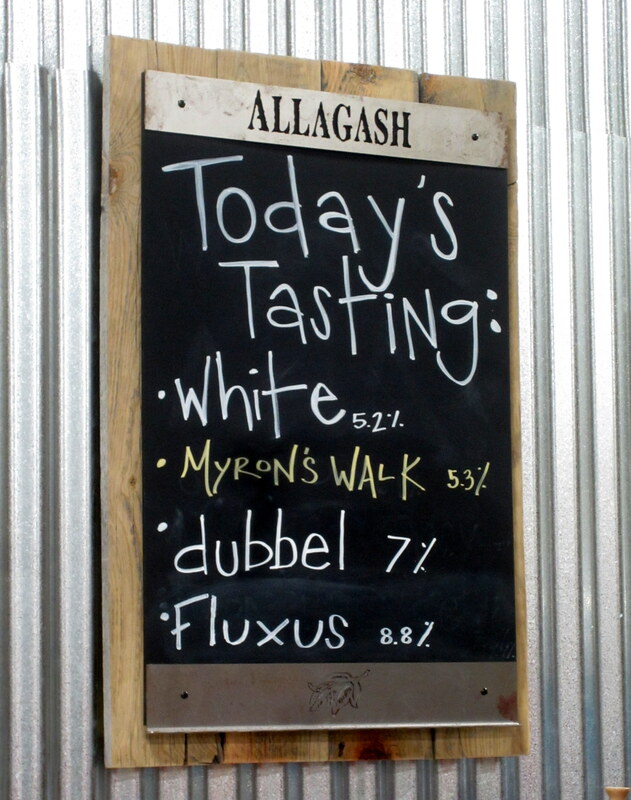 Fluxus 2014 – Every year Allagash releases a beer called Fluxus to celebrate their anniversary, and every year the beer is a different style (similar to Alesmith’s Decadence line of beers). The word fluxus is a latin word meaning continuous change which is fitting for a beer that can vary wildly from year to year. The 2014 version is a golden ale brewed with spruce tips and honey. Apparently spruce tips are a traditional ingredient used in New England brewing for bitterness, particularly when hops were scarce or unavailable. The spruce tips, along with German Hallertau hops, give this beer an unusual but very nice spicy aroma and taste that melds with oaky notes from the barrel aging. I would not have guessed that honey was used in this beer because it is drier and less sweet than either the Dubbel or the White. This was the probably the best of the four beers we sampled. The tasting lineup on the day we visited. Unlike some breweries I’ve visited (Three Floyds, Toppling Goliath) the selection of bottled beers on sale in the retail shop was extensive. Because Allagash doesn’t distribute to Ohio I was tempted by many offerings in the refrigerated beer cooler, but the space available in my small suitcase and the relatively steep price of most specialty beers limited me to a couple of selections. I opted for a 375 mL bottle of Resurgem, an unfruited Geueze made in the coolship, and a 750 mL bottle of the bourbon barrel aged Curieux. They also offer merchandise ranging from t-shirts to glassware to tap handles, along with some less conventional items. While I was intrigued by the set of Allagash horseshoes, I thought the $149 price tag was a little steep, so I settled for a t-shirt. After the tour we were in the mood to sample a few more Allagash beers, but as noted above Allagash does not sell beer for consumption at the brewery. That was a little disappointing, but the woman who was working the tasting room bar suggested that we visit the Great Lost Bear, a venerable beer bar/restaurant. So we piled in the car and headed into Portland, doing our best to avoid becoming the Great Lost Party of Chemists. I’m happy to report that the Great Lost Bear did not disappoint. They had eight Allagash beers on tap—White, Black, Saison, Trippel, Curieux, Confluence, Victor and Myron’s Walk, along with approximately seventy beers from other breweries, including many from New England and a couple of cask ales. They sell flights of the Allagash beers and they have an extensive if somewhat eclectic food menu. I can’t help but mention the The Almighty Cheesus Burger, a hamburger where the top and bottom buns are replaced by grilled cheese sandwiches. As if that weren’t enough cholesterol to put a grizzly bear on statins, you can add bacon and a fried egg for a few dollars extra. I stuck to the fish and chips and paired that with a glass of Confluence, a golden ale made with Brettanomyces yeast. Both the beer and the food were delightful. The Great Lost Bear should be a mandatory stop at the end of your Allagash tour. If we had more time we would have next driven twenty minutes north to Freeport to visit Maine Beer Company who brew some absolutely delicious hoppy ales. Unfortunately we had to get down to Boston by 4 pm so that everyone could catch their flights. So we reluctantly said goodbye to Portland and headed south on I-95 for Boston. It was interesting to get a look inside this pioneering American craft brewery, and it’s hard to imagine many free brewery tours that let you sample beer this good. Many of the barrel aged beers are limited releases and the brewery is probably the best place to get your hands on some of the hard to find Allagash beers. (In Ohio of course all Allagash beers are hard to find because they don’t distribute here.) If you are in the mood to keep sampling when the tour ends I strongly recommend you follow it up with a stop at the Great Lost Bear. Although we were only able to spend a few hours in Portland, the city seemed like it had a lot to offer. I wish we could have spent a day or two in Maine. This may have been my first visit to Maine, but I hope it won’t be my last. I seem to recall spruce tips as a popular ingredient for New England beers, at least historically. Never had a beer made with them, nor do I recall actually ever seeing one in-person. On the flip side, I tried Allagash’s Coolship Red at this year’s Savor event in DC and it smelled like a dirty diaper while tasting like farts. On the same trip my friend Andrew had a beer by Lawson’s Finest Liquids called Spruce Tip IPA, so perhaps this may be coming into some popularity in New England. Having said that those are the only two beers I’ve come across brewed with spruce tips. Harvesting enough spruce tips to brew a sizable batch of beer may not be that easy. I’m hoping my bottle of resurgem tastes better than your experience with Coolship Red. I guess we will see. Spontaneously fermentation can lead to unexpected results but one would think that is not what they were aiming for.